Chelsea have sacked manager Antonio Conte after two years in charge. Ex-Napoli manager Maurizio Sarri is expected to succeed his compatriot at Stamford Bridge. Should Sarri be appointed, he would be Chelsea's ninth full-time manager since Roman Abramovich bought the club in 2003. During three years with Napoli, Sarri did not win a major honour but guided the club to second, third and second again - behind Juventus in 2017-18. The former Empoli manager was named Serie A Coach of the Year in 2016-17. Chelsea announced on Friday that Conte had "parted company" with the club. A 61-word statement ended: "We wish Antonio every success in his future career." For the sixth time in eight seasons the Premier League's title-winning manager has left his job by the following summer - if not earlier. Conte has a clause in his contract that guarantees him a pay-off, thought to be £9m, for the final year. The club's Premier League opener is away at Huddersfield on 11 August. Why did Conte's Stamford Bridge reign turn sour? Conte's 30 league wins in the 2016-17 campaign was a record until Manchester City produced 32 in 2017-18. He set a club record 13 consecutive league victories. His league win percentage of 67.1% is better than Sir Alex Ferguson's 65.2% and only bettered by Pep Guardiola's 72.8% in the Premier League. He won 69 and drew 20 of his 106 games in charge of the club. I've always thought of Chelsea as an extremely well-run club, but now we're in a situation where they've pulled the plug on their new stadium, and the managerial situation has dragged on and on throughout summer. Conte even turned up for pre-season training. It hints at disharmony and it makes you wonder about the state of the club at the moment. Conte's future was under scrutiny even as his side beat Manchester United to lift the FA Cup in May, but he remained in place at the club. However, his exit has been anticipated all summer after the Blues missed out on Champions League qualification. The FA Cup win means Conte - who managed Juventus from 2011 to 2014 - has won a major trophy in each of his past five seasons as a club manager. The 2017-18 campaign proved a fractious one for the west London club. Conte was outspoken about the congested festive fixture list and at times visibly agitated in news conferences when questioned about a public row with Manchester United manager Jose Mourinho. Chelsea ultimately finished 30 points behind Premier League champions Manchester City and exited the Champions League at the last-16 stage after a 4-1 aggregate defeat by Barcelona. 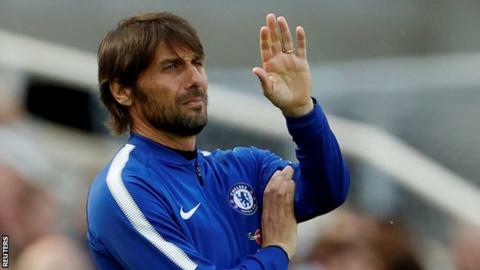 In mid-October, the Blues were beaten by a Crystal Palace side who had gone into the match with no points from seven games, prompting Conte to dismiss rumours of unrest over his training schedule. They suffered back-to-back league defeats twice after Christmas - first by Bournemouth and Watford, and then against Manchester City and Manchester United - and a run of four straight victories late in the campaign could not secure a top-four finish. Russian billionaire Abramovich took control of Chelsea in June 2003, with Claudio Ranieri - the future title-winning manager with Leicester - already in charge. Ranieri lasted less than 12 months into Abramovich's reign, and was sacked in May 2004 after almost four years at the club. No manager has lasted that long since. Like a number of his predecessors, Conte has been dismissed the season after winning a major trophy.